Remember that Aerostich Transit suit I tested last year? Well, when Aerostich sent the waterproof leathers to us, they asked that we give the suit a two-year review, to see how well it worked after it was fully broken in. So, for 2012, I continued to use the Transit for highway and street riding. It handled this work well again throughout the second riding season, and just kept getting more and more comfortable the more I wore it – which is what Aerostich was getting at. Most importantly, the ‘Stich’s waterproofing has held up over the two seasons I’ve run it, although I did have some water leak into the crotch area once, during a particularly windy cloudburst. However, I’m fairly confident that this was due to not zipping the suit together – the resulting gap let the wind drive water into the suit. This didn’t happen again, even when I rode through all-day downpours, with the suit zipped together. But there have been a couple of issues. I’ve noticed the pockets allow moisture in — probably through the zippers — but thankfully that leakage doesn’t extend into main part of the jacket. So just be careful what you store in the pockets in the rain. Those riders who store their wallet in their jacket pocket may be rewarded with a pile of soggy money after riding through a rainstorm (a problem CMG staffers never seem to have, as Editor ‘Arris pays us with his leftover bus tokens – and don’t forget the shiny buttons too, Arris). Day-long deluges do present another challenge, though; even though the suit is waterproof, if you ride in the rain long enough, you’ll get soaked from the collar down. Unfortunately I don’t think there’s any way to get around the problem of water seeping down your neck, without a total collar re-design. My experience tells me that if you’re going to commute in the suit, or even travel an hour or two in the rain, you can likely get away with running the Transit alone. If you’re planning to ride across the continent, you may want to pack a cheap rain jacket with a high collar, just for the days when it rains from dawn til dusk. Overall, this suit has held up very well. After a year of use it fits “just right” now, yet the leather and stitching are still in great condition, and I expect it will continue to hold up for many more years. So it’s thumbs up for the Transit suit; just keep your wallet in a ziplock baggie. 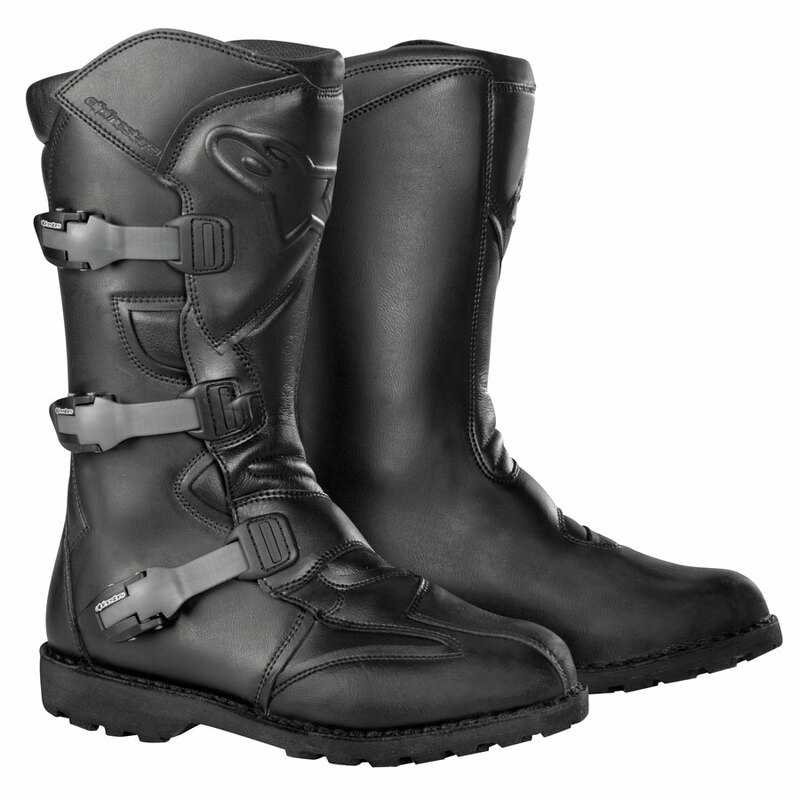 These are very similar to the Durban boots that Editor ‘Arris ran a couple years ago; one of the main differences is that the sole is replaceable on the Scouts and they have Alpinestars’ proprietary waterproof lining, not Gore-Tex, like the Durbans have, and they’re actually cheaper to boot, so to speak. On the downside, the polyurethane-coated leather on the Scouts doesn’t look as nice as the stuff the Durbans are made of, either, and much like the Exustar boots I used in 2011, the Scouts leave you looking a little like Napoleon Dynamite. 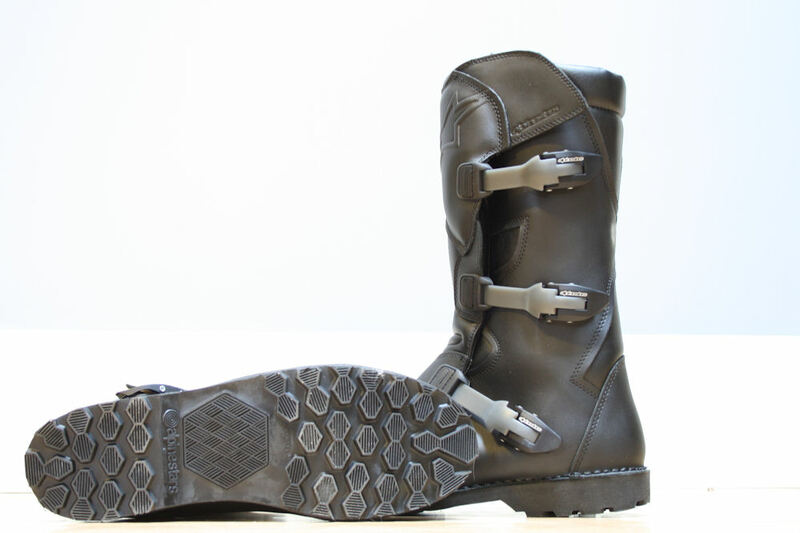 Like any good dual-sport boots they’ve got shin armour (plastic), and they’re CE-approved. I also found that the sizing was accurate to what I usually where, something that can’t always be said of some of the Alpinestars gear we’ve tested (they tend to fit a little small). But enough about what they are, how do they perform? Well, the Scout boots have a fantastic reputation on sites like ADVrider.com; and so far, they’ve lived up to their solid reputation. They kept their waterproofing through the whole season (unlike the Exustars last summer), and have proved to be quite comfortable with short break-in period. They’re even comfortable to walk around in once off the bike – I hiked around Signal Hill in St. John’s, N.L. in these boots. 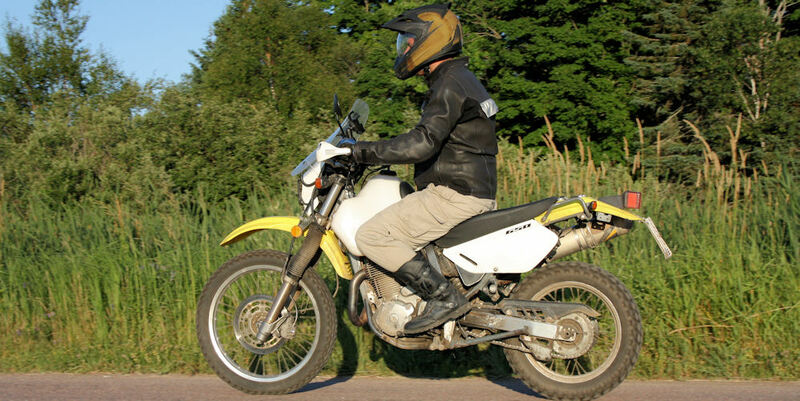 After a summer of light trail riding aboard my DR650 and three days of off-roading in the Ganaraska, they were still as good as new. 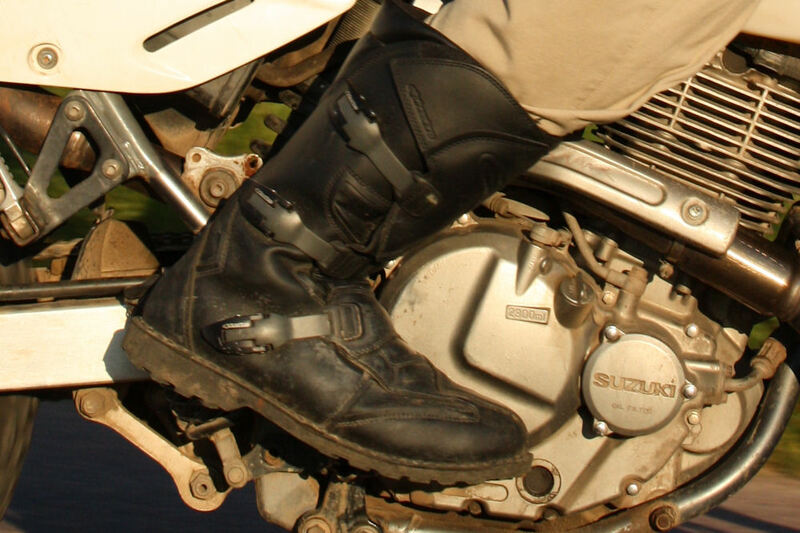 They’re not as well-armoured as a set of Alpinestars’ high-end motocross boots, but they provide enough ankle and shin protection to do the job for sensible dual-sporters. I wouldn’t pull Evel Knievel-style jumps in these puppies, but they work fine if you want to ride dirt at sane speeds, and they’re plenty comfortable for the street. The boots are a bit hot, like most waterproof motorcycle boots. If they start to stink a bit, you can always remove the insoles and wash them. What else is there to say, really? If these boots continue to hold up long-term, I think they’d be a great buy. If the sole wears out, I can replace them. So far, they’ve earned a solid recommendation from me. 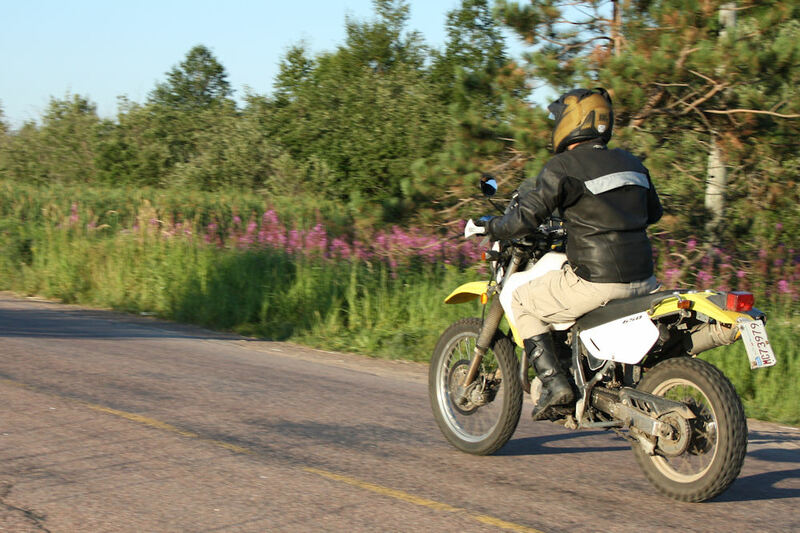 The Erzberg gear is named after the famous Austrian off-road rally. This would be pretty heavy stuff to be wearing in a hard-core dirt competition, though. 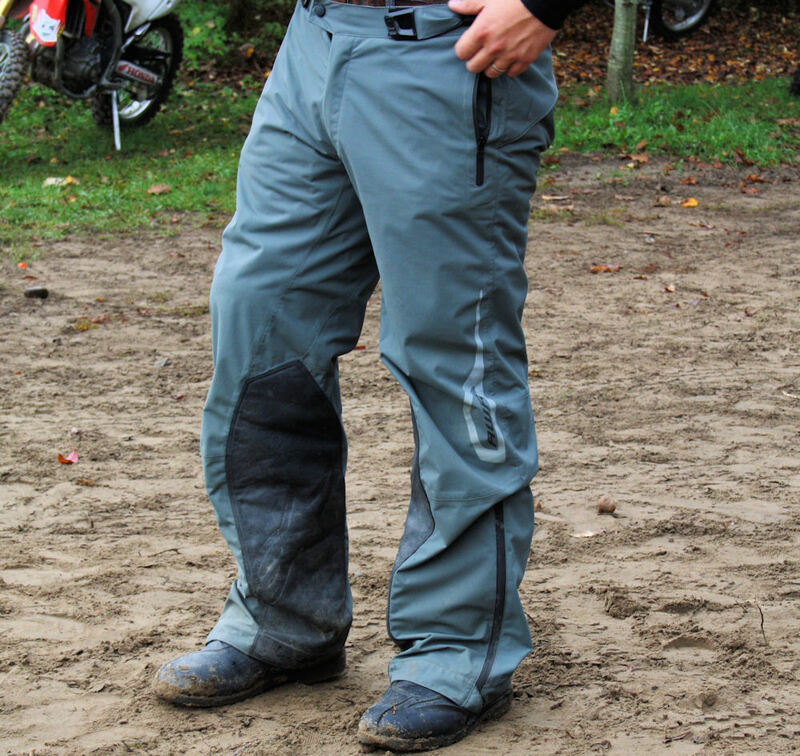 The Erzberg jacket and pants are fairly new; they’re designed for wet-weather enduro riding – not for street use. That’s important to know, because it doesn’t seem they’d offer much protection in a crash (even though they were sent to us as dual sport gear). There’s no padding anywhere, and they’re made of very light material that doesn’t appear to have much abrasion resistance. However, that’s not the point of this gear. The pants and jacket both feature Alpinestars’ proprietary Drystar technology, and waterproof zippers. The jacket has three zippered exterior pockets, and one interior pocket, along with two zippered vents on the front (there are no vents in the back), whereas the pants have two zippered pockets in front, and no vents. At 6’, 210ish pounds, I normally wear a size L jacket and pants. I ended up with a size XL jacket (it’s a bit baggy) and size 2XL pants (and they’re a bit tight), which again makes me question Alpinestar’s sizing chart. Frankly, I wasn’t terribly impressed with this set of gear. While it did shed rain quite well, it didn’t offer anything technically impressive – there’s no special breathability for your money which means you tend to overheat when you’re working out in the dirt. Also, the jacket’s elastic had failed by the end of the season, without seeing too much use. The jacket also tends to flap around a bit in the wind as there’s not enough capability to cinch the suit (the jacket has Velcro adjustments on the cuffs only, and the pants have Velcro adjustment on the waist). Some of these are picky things, but this is expensive for a rainsuit, so I’d expect better. I wouldn’t recommend buying this outfit unless you liked the way it looked, in spite of its drawbacks. As for crashability, I had a very low-speed get-off in the sand, and didn’t tear any holes, though I don’t know how well it would hold up to a higher-speed crash in the dirt. There are no provisions for attaching the jacket to the pants, and there are no provisions for inserting armour into the jacket or pants. 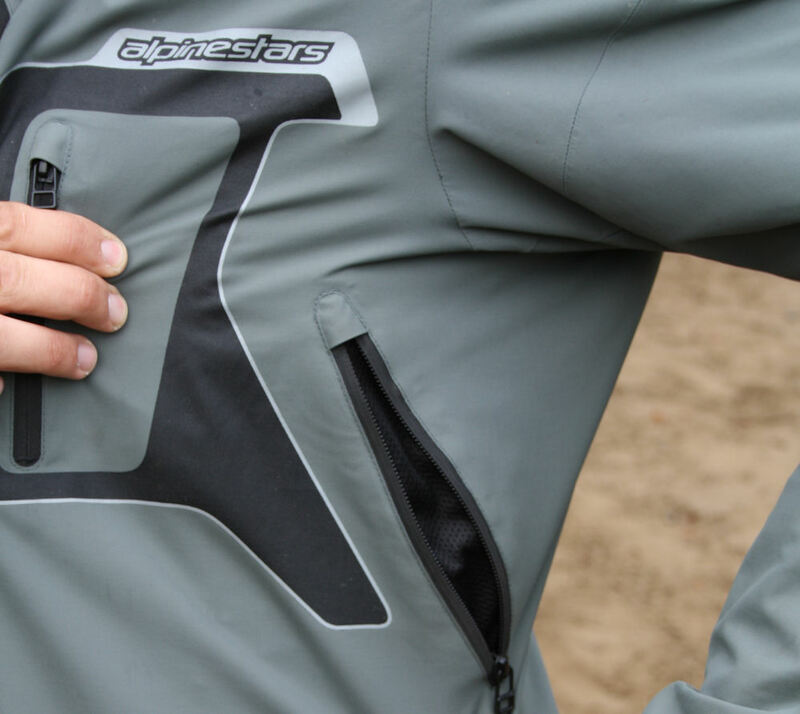 Alpinestars’ Bionic jacket isn’t a jacket in the common sense of the word – it’s really just a bunch of armour held together with mesh and zippers, intended to be worn under a jersey or outer jacket. However, it’s ideal for wearing under something like the Erzberg jacket. 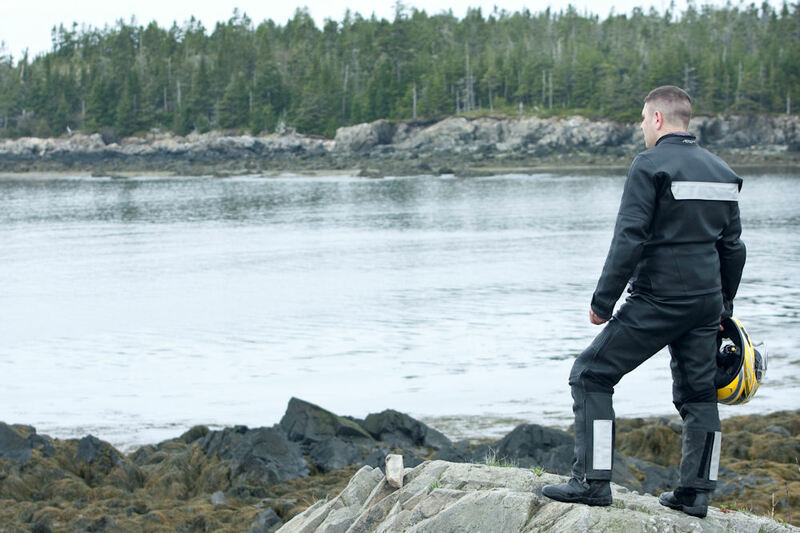 The Bionic jacket has hard-shell padding for your back, elbows/forearms, chest and shoulders. The back protector is removable; it’s rated to EN 1621-2 Level 1, and should accept most neck brace systems. The elbow and shoulder protection is rated to EN 1621-1; the whole assembly is CE-certified. The unit has zipper closure on the front along the chest region, as well as a wide waistband with Velcro closure to keep everything in place. 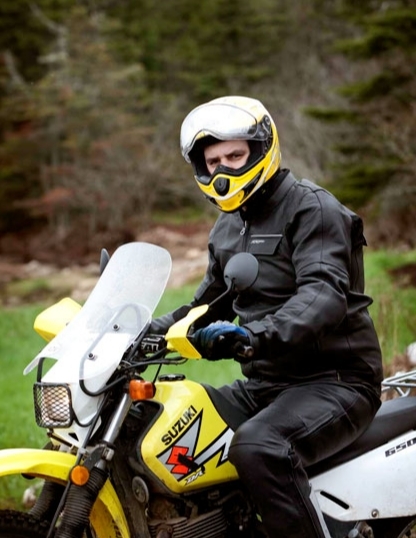 Even without an over jacket, it can still be hot to wear if you’re wrestling handlebars off-road, because it’s a tight fit (which is what you want with armour), but at least it has some airflow through it. The sleeves are also removable, if the rider wishes to shed some gear for comfort or ventilation. 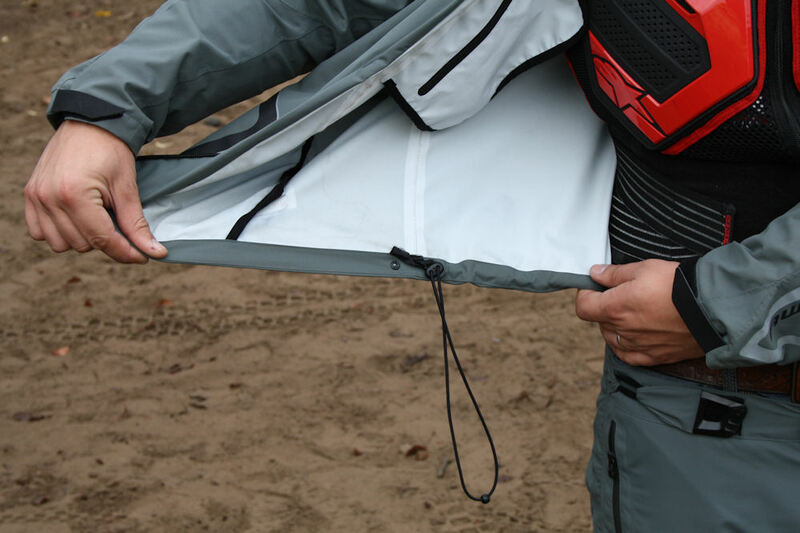 The removable back protector is the jacket’s weakest point; on the sample I had, the zipper tended to work its way loose, allowing the protector to come semi free – which could be a problem in a crash. 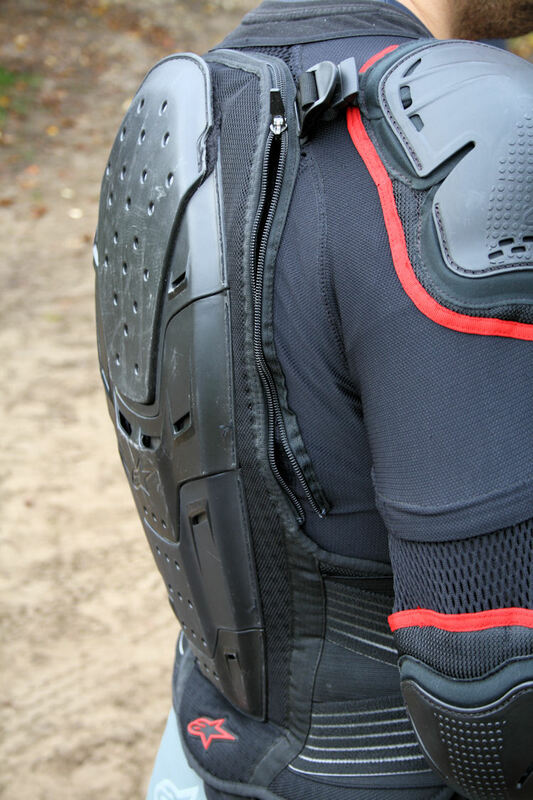 You can wear the back protector on its own, but it’s something that shouldn’t be an issue. I found the jacket to be fairly comfortable and although I never crashed in it, combined with the Erzberg jacket, it proved to be a good combination. It certainly added a lot of confidence when I wore the Erzberg. Aside from the zipper issue, I liked it, and would recommend it. The Alpinestars Vega gloves were not as waterproof as they should have been. What about gloves? Well, surprise, surprise, I also tried out gloves from Alpinestars this year – their Vega Drystar all-weather riding gloves. which have Alpinestar’s Drystar lining, along with Thinsulate thermal insulation. 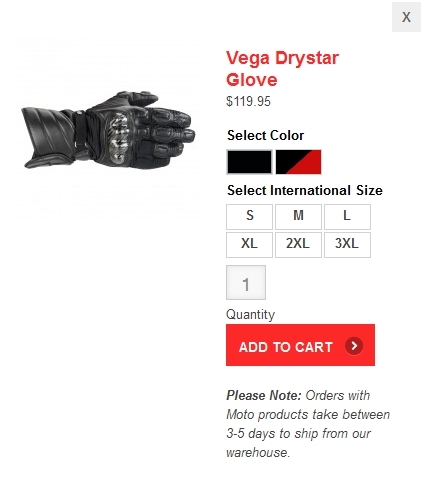 Sizing is a bit iffy with the Vega gloves, as it is with much of Alpinestars’ lineup. The gloves are made of leather, neoprene, and synthetic suede and fabric, and they have carbon fibre protection on the knuckles, which means a lot of stitching. They also have 4mm foam padding on fingers, thumb and wrist, and Micro-Velcro closure at the wrist and cuff. The big test was waterproof test came during my trip across Newfoundland, and while the waterproofing held up for a while, there were a couple of days where I rode all day in the rain, and they were soon saturated, leaving my hands rather wet. I also wore them a few times in hot, humid weather (not Newfoundland) where they tended to be on the hot side, proving best-suited for riding at the end of the season. Although I wear L or XL gloves normally; I found the XL gloves a bit too snug and as a result they were pretty hard to put on once the lining got wet, leaving me even more frustrated. As you may have gathered, I wasn’t very impressed. 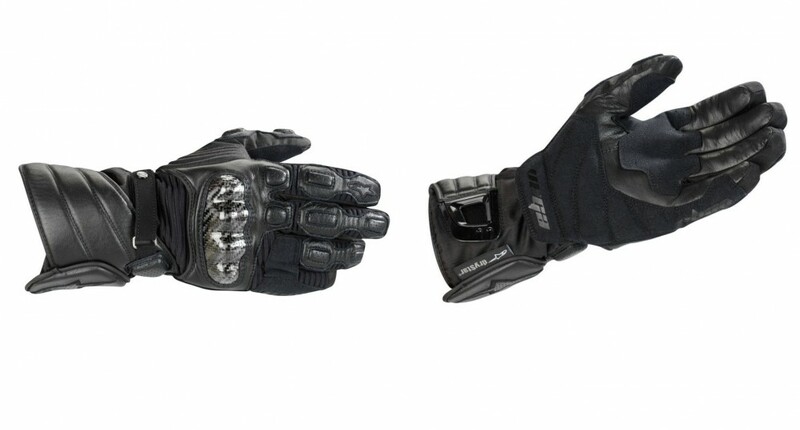 For $130ish retail ($119 on Alpinestars’ website, see pic) you should get more for your money. I should note that last year’s Alpinestars gloves didn’t fare well either this summer, with more stitching coming apart. Finally, I retired the G-Max GM-37 helmet, and ran an Icon Variant Battlescar helmet this season. Everybody seems to like the Battlescar finish, even non-riders. I’m a big fan of this lid. Despite the goofy-looking spoiler on the back, I personally found it quieter than some of its more expensive counterparts. Wind noise is definitely noticeable, though – pack earplugs. Icon says a lot of design work went into this helmet – the anti-glare visor is supposed to be built to resist wind lifting forces, and the rear spoiler is supposed to reduce buffeting. It works very well. I wore this helmet for thousands of touring kilometres this year on an NC700X, which has little protection. While heavy crosswinds could twist my neck around, despite the large peak, it handled high-speed highway riding very well. It has a fiberglass/Dyneema/carbon fiber shell that reduces some weight, and like most good helmets, it’s designed with an oval shape in mind to comfortably fit heads. The padding is removable for washing, which is good as it had a very funky chemical smell when I first got the helmet, but this has mostly disappeared. Venting is excellent for this helmet; I found it comfortable both on- and off-road and since I wasn’t able to fog up the visor, the anti-fog design does its job too. The Battlescar finish is pretty cool as well; I had plenty of people, riders and non-riders alike, tell me they liked my helmet. Plus, if you scratch it, nobody is going to notice. I received a size L helmet, my usual size, and it fits quite well. 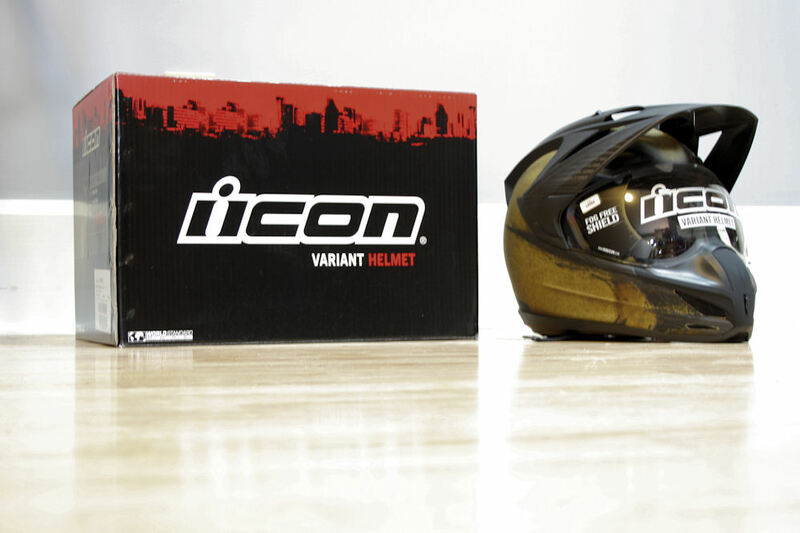 In my opinion, Icon nailed this one and is well priced when compared something like Arai’s XD line. The Variant’s visor looks goofy, but it’s quiet. The Vega gloves are not as waterproof as they should have been. say how about some gear for women, It’s hard to find any feedback or tests of women’s gear especially if your wife is very small like mine. You guys need to invest in some male models. Please. For the sake of the children. If only it was in the budget. Maybe we should get Fabio – he’s actually a huge bike fan, ya know. Yes, yes he is. I was more thinking Larry or Bondo. I hear they work cheap.